RESISTOP solid phenolic lab-resin grade panels were previously manufactured solely in black S-401 color according to industry requirements and primarily to match epoxy color standards or design preference. With the introduction of advanced technology and new formulations, a wide range of solid colors, patterns and wood grains are being produced in lab resin grade quality. The specification and installation of solid phenolic Resistop laboratory grade panels is now only limited by the designer's imagination. 25 mm (1" Thickness) and minimum thickness of 6 mm (1/4”) chemical resistant thin laminate are a special category of decorative panels engineered to resist a wide variety of staining from acids, solvents, general reagents and cleaning agents. "Solid composite phenolic core chemical and stain resistant panels. Material shall be a natural kraft paper cellulose-fiber based, saturated / impregnated with phenolic resin and processed under high heat and pressure to form a composite panel, to provide a work surface with high chemical resistant and abrasion resistant properties. Surfaces shall have a uniform low-sheen matte textured surface and the finished material shall be extremely hard and resistant to scratches and abrasion"
Resistop is a solid composite panel, and alternatively a high-pressure laminate engineered as laboratory grade surfaces commonly exposed to acids, solvents, general reagents and cleaning agents. Produced in North America at an ISO Certified Wilson Art facility with Chemsurf Technology, Resistop is also rated as a “anti-static protective material” by the American Society for Testing and Materials (ASTM D257-78) and is primarily suitable for laboratory work surfaces, fume hood decks, Fumehood liner panels, pegboards (drying racks), reagent racks, commercial countertops, cabinet drawer fronts, locker drawers, shelving, window sills, toilet partitions, and decorative casework components. Resistop panels provide exceptional chemical and stain resistance with the flexibility and design advantage of thick, solid phenolic cores and alternatively, postforming or flat grade laminate. GreenGuard Certification: The Greenguard Environmental Institute certification for high-pressure decorative laminate should be implemented where practicable with respect to Greenguard Indoor Air Quality Certification. To receive Greenguard certification, a product must pass the institute’s stringent chemical emission tests and conform to its strict standards. The Greenguard certification assures professionals and users alike that solid phenolic core products will not add harmful contaminants to the indoor air. Resistop is manufactured utilizing Phenol Formaldehyde resins (Phenolic Resins) rather than Urea Formaldehyde. Phenol Formaldehyde resins produce less free formaldehyde and thereby reduce the level of airborne contaminants in indoor air environments. Insist upon RESISTOP Phenolic Resin based composite panels for countertop applications. Resistop sheets contain a minimum of 20% recovered materials by weight and only use certified renewable forest products. They contain no heavy metals, rain forest timbers or tropical hardwoods. Greenguard certified low-emission surfacing makes for a healthier environment in any setting: commercial, residential, hospitality or healthcare, K-12 schools for furniture products. Resistop solid phenolic can be used as a surface on Greenguard-certified office or school furniture to obtain a LEED-CI credit for Low Emitting Office Furniture (Leadership in Energy and Environmental Design Rating System for Commercial Interiors). Solid phenolic Resistop is available (up to 25mm (1") thickness) with the typical thickness required as 3/4" (19/20mm) or 1" thick (25mm). 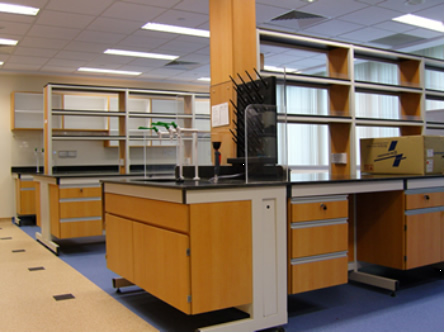 With a choice of over 250 solid, granite like and patterned color or wood grain colors, designing laboratory countertops, shelving, and other diverse applications, has never been easier for architects, consultants or in-house personnel. Limitations: RESISTOP panels offer special protection for many types of laboratory work surface applications. However, no one material is suitable for all possible conditions; its properties should be checked for suitability under the specific conditions of each installation. The information provided herein is not intended for or to guarantee specific properties. Procedure: The following reagents were placed in contact with a Resistop laminate surface and placed under a 1" (25.4 mm) diameter watch cover glass for 16-24 hours before being evaluated, in accordance with NEMA LD3-2000 test methodology and SEFA 8-1999 testing requirements. The effects of staining are color and pattern dependant. 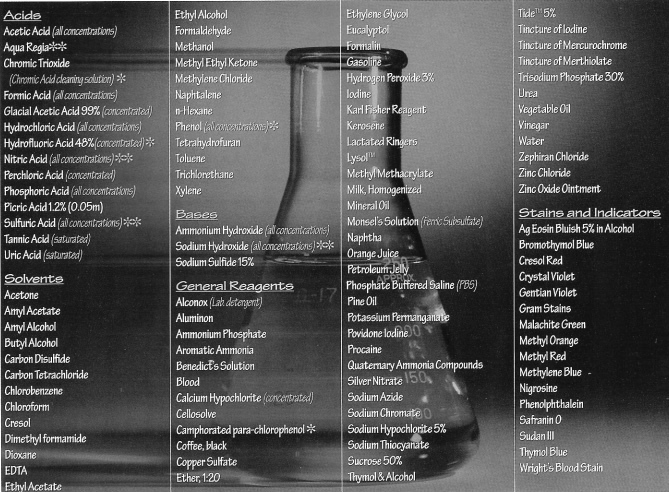 Results: Below is a summary of the test results collected with commonly used chemicals and staining agents. **Causes slight damage, with degree of damage proportionate to length of exposure and concentration. Other listed items leave no effect. **NOTE: Special production sheet size. Not in stock. Full pallet load - Minimum order requirements are needed per thickness and color for production purposes. 1) Matte (MT) / Suede (SD): A fine, subtle matte cashmere texture with a slight sheen. Double Sided Panels - Resistop can be manufactured "good two sides" at a slight up-charge and each side is available with the same color, while providing the same chemical resistant characteristics. The lab grade panels are normally produced good one side. Colors - 250+ Solid colors to include Black, Light Gray, White, Ivory, Blue, Green, Tan, etc. (See color chart on separate menu). MANY OTHER SOLID COLORS IN LAB RESIN GRADE AVAILABLE UPON REQUEST. Peel Coat - A removable, factory applied single sheet of polyethylene peel coat may be applied to one side for protection of the working surface, at a slight up-charge.